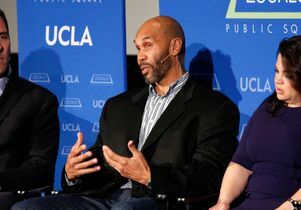 UCLA professor Darnell Hunt, co-author of the recently released Hollywood Diversity Report, talks about some of its findings as Hollywood Reporter executive editor Matthew Belloni and Christy Haubegger of Creative Artists Agency listen. 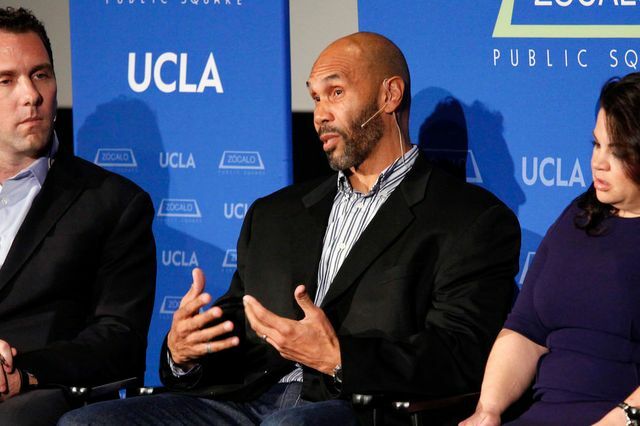 Just a few days after an Academy Awards ceremony that host Neil Patrick Harris joked honored “Hollywood’s best and whitest,” entertainment insiders at a “Thinking L.A.” event co-presented by Zócalo, UCLA, and UCLA’s Bunche Center for African American Studies addressed the lack of diversity in the industry head-on and the findings of the center’s just-released Hollywood Diversity Report. 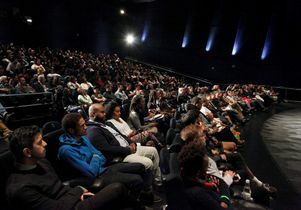 In front of a full house at the ArcLight Hollywood Wednesday night, a panel that included Darnell Hunt, Bunche center director, co-author of the report and a professor of sociology at UCLA, discussed why the people we see on screen don’t reflect the country’s demographics and the experiences of minorities. 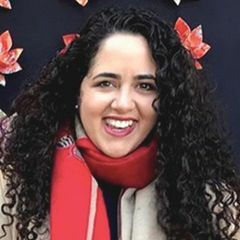 Hunt, who wrote the report with Ana Christina Ramon, also with the Bunche center, said that he was not surprised by most of this year’s findings, which came from analyzing 200 films and more than 1,100 television shows released in the 2012-13 season. Film directors, writers and actors remain overwhelmingly white and male; TV is more diverse, but both nonwhites and women remain vastly underrepresented. Matt Belloni, Darnell Hunt, Christy Haubegger, Franklin Leonard and Brian Dobbins talked about why the faces we see on screen don't reflect demographics and minority life. Hunt said that white men have dominated positions behind the camera for many years. In a high-risk industry, they want to feel they have the best chance of succeeding, and so they tend to hire people who look and think like them. Hollywood Reporter executive editor Matthew Belloni, the evening’s moderator, asked panelist Christy Haubegger of Creative Artists Agency (CAA) how she overcomes these hurdles for her clients, who include Sofia Vergara and Eva Longoria. Haubegger said that the agency often has to offer a course in “Multicultural 101” to television networks. Agents explain the market, offering executives a rundown of “what [audiences] are watching versus what you think they want to watch.” And CAA invests more heavily and thoughtfully in the success of shows with diverse casts. For the TV show “Empire,” for example, which premiered in January and stars a primarily black cast, CAA worked to create buzz starting in December with a special screening and reception. Belloni pointed to the Hollywood Diversity Report’s finding that 100 percent of chair/CEO-level film executives are male and 94 percent are Anglo, while 96 percent of chair/CEO-level TV executives are Anglo and 71 percent are male. The deck is pretty heavily stacked, he said. Franklin Leonard, founder and CEO of the Black List, which compiles Hollywood’s most popular unproduced screenplays each year, said that, despite the global success of stars like Will Smith and Denzel Washington, executives are convinced that movies starring people of color don’t sell internationally, so they don’t market them internationally. But the movies that sell internationally are the ones that are marketed most heavily. “You end up in this vicious cycle that’s [confirmed] bias over and over again,” said Leonard. 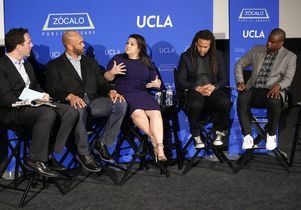 “Black-ish” executive producer Brian Dobbins, another panelist, said that he’s had many conversations over the years with studios and networks that haven’t helped to change perceptions about projects made by and about people of color. But he’s starting to see a change this year with the success of his show and others, including Shonda Rhimes’ stable of hits. “I feel like there’s never been a better time to be who we are than right now,” said Haubegger. She believes that Hollywood is in the early days of a major shift. Executives are starting to recognize that diverse TV shows and movies sell — and that Latinos especially buy a lot of movie tickets — and they’re looking to capitalize. What remains difficult is creating a pipeline of diverse Hollywood writers, directors, executives, and agents. How effective, Belloni asked the panelists, are diversity programs that place talented nonwhites and women in industry jobs? Haubegger said that these programs are “necessary, but not sufficient in my mind.” She likened them to telling a coach he has to put a new player on the field he didn’t pick, and whose salary he’s not paying. The coach will use the player — but may not want to pick up the salary after the season has passed. Belloni asked the panel if they think we’ll continue to see a rise in diversity in front of the camera. Yes, said Haubegger. She said that CAA’s diverse clients have many more opportunities this year than in the past, pointing to Eva Longoria’s and Jennifer Lopez’s new TV series. “At the end of the day, the color that matters most in Hollywood is green,” said Leonard. But he cautioned that studio executives won’t have demonstrated their commitment to diversity until they invest in marketing films with people of color overseas. In the question-and-answer session, a member of the International Cinematographers Guild said that his labor union is 2 percent or less African American. He asked Hunt if he has plans to investigate the diversity of the people who work “below the line” in Hollywood. “The numbers are abysmal,” said Hunt, who added that they were planning to look into these figures in the next few years. Another audience member referred to a recent article by Chris Rock on Hollywood’s “Mexican problem.” How, she asked, can Hollywood continue to underrepresent Latinos when so many Latinos live in Los Angeles? “When I tell people in Hollywood that Los Angeles is 50 percent Latino, they say, ‘No way,’” said Haubegger, who responds by telling them to go east of the 405. Leonard said that the people making the big decisions in Hollywood don’t realize the world is diverse because their own social worlds are “almost entirely white” and upper class or upper-middle class. “If you don’t have a black doctor or a Latino accountant,” he said, “and your only interactions are with those people who reflect the screen,” like gardeners and nannies, you’d think it’s crazy for Shonda Rhimes to cast a diverse hospital. This story was adapted from a piece posted on the Zocalo website.